Miss North Carolina’s Outstanding Teen 2016 Catherine White of Clayton was the First Runner Up over-the-weekend at the 2016 Miss America’s Outstanding Teen Pageant. The pageant was held in Orlando, Florida. Catherine is the daughter of David and Amy White of Clayton. She received a $10,000 scholarship. 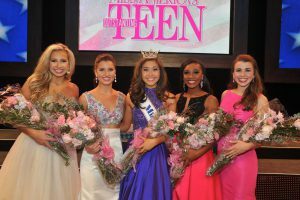 Miss Oklahoma’s Outstanding Teen Nicole Jia was crowned Miss America’s Outstanding Teen. With her platform, Jia will act as the official National Teen Goodwill Ambassador for Children’s Miracle Network Hospitals, a non-profit organization. Miss North Carolina’s Outstanding Teen is a state preliminary for the Miss America’s Outstanding Teen Organization.